Posted on Tue, Feb 14, 2012 : 5:30 a.m.
Greenhills junior Andrew Khouri, right, is averaging a Washtenaw County best 23.7 points per game. Watching the Greenhills School boys basketball team warm up, there doesn't look like there's a 20 point per game scorer in the bunch. Sure, there's the 5-foot-9 kid who shot NBA-range 3-pointers in practice, making three in a row. He's probably alright. And there he is again, during the national anthem, going down the line and giving fist bumps as the final note of the recording plays. Decent player, decent leader? Yeah. But responsible for almost half his team's scoring? No way. Way. When the game begins, it's easy to see why. One Newport Lutheran South player, near mid-court, passes to another, a seemingly routine pass to start the offense. In darts that kid, stealing the ball and jetting toward the other end. As one Saint appears to be close enough to block the shot, he ducks under the basket and makes a reverse lay-in, drawing impressed cheers from the group of Greenhills students in attendance. On another possession, his defender playing off him and respecting his ability to drive to the basket like he does countless times a game, he stops, pops and hits a three. He may not look impressive, but everything else about Andrew Khouri's game is. 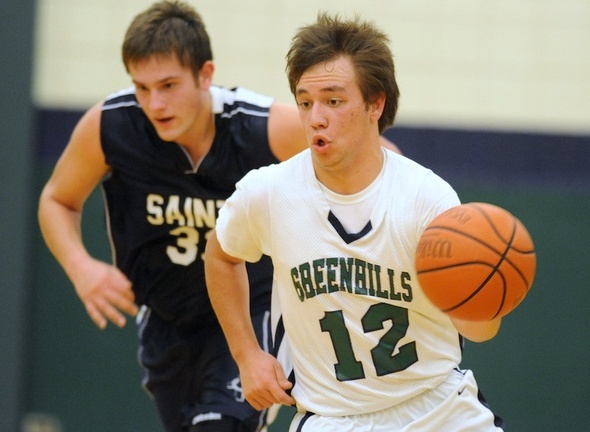 "He doesn't stand out in a crowd as being a great athlete," Greenhills coach Andrew Wright said. "But he's a bonafide scorer." Khouri is averaging a Washtenaw County-best 23.7 of his team's 53.1 points per game in leading the Gryphons to a 10-6 record. But it hasn't been easy. The team started 0-4. Wright thought Khouri was trying to do too much offensively. Khouri admitted chemistry was awkward, as only three of his 13 teammates this season were his teammates last season and only one played regularly. The losing streak was capped by a 72-61 home loss to Novi Franklin Road Christian, even though Khouri scored 35 points. Wright described his team as being pushed around and manhandled. Two brutal practices over the holiday break may have left Greenhills players hoping the Mayans were right about that whole 2012 thing. Greenhills is 10-2 since starting the season 0-4, and Khouri trusting his teammates has contributed to the success. But something clicked. The team bonded over those practices. A motion offense got Khouri better looks against box-and-ones while also getting his teammates involved, and Khouri gradually scaled back his shots. "I started to trust my teammates more, which caused winning, so I can't complain," he said. This isn't to say that Khouri is a selfish gunner at heart. Some scorers as prolific as Khouri know their stats to the decimal point. When Khouri was asked how many points he averages and he said: "20, maybe over 20." "It's fun to hear," Khouri admitted after hearing the actual average. "But I only care about winning. I just want to win districts. That's my first goal." That unselfishness was on display on two occasions in Wednesday's 45-22 win against Lutheran South when he threw alley-oop type passes to his teammates. The first went off his teammates' hands and out of bounds. The second his teammate couldn't convert the layup. There were no eye rolls, no slumped shoulders, no stares. He just ran back on defense. "It's not that frustrating because I know that I make as many mistakes as everyone else," Khouri said about those plays. "Those balls, I could've thrown a little lower for them." He may claim to make as many mistakes as his teammates, but there's no doubt who leads the team in good plays. 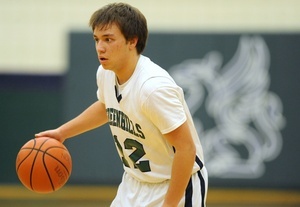 On Jan. 31, he hit a buzzer-beating 3-pointer to beat Westland Huron Valley Lutheran 42-41. On Friday, he scored 38 points in a 58-54 win over Taylor Baptist Park after a loss in the teams' earlier meeting. Box-and-ones have become de rigueur for opposing coaches hoping to avoid similar Khouri heroics. "He's a game-changer," said Ann Arbor Rudolf Steiner coach Nick Sherwood after Khouri went for 23 points in a 69-59 Greenhills win on Feb. 6, despite sitting out the last four minutes in foul trouble. Sherwood switched from a box-and-one to a zone during the game, on one condition. "I told my guys at halftime they have to call out where he is at all times, otherwise they're sitting next to me," Sherwood said. "And they did it, it's just..."
"He's fast. He's good. He's a good ballplayer."